Kevin wearing Roger Charles New York, his previous shirt collection, shot for Esquire’s Fall 2011 Black Book. 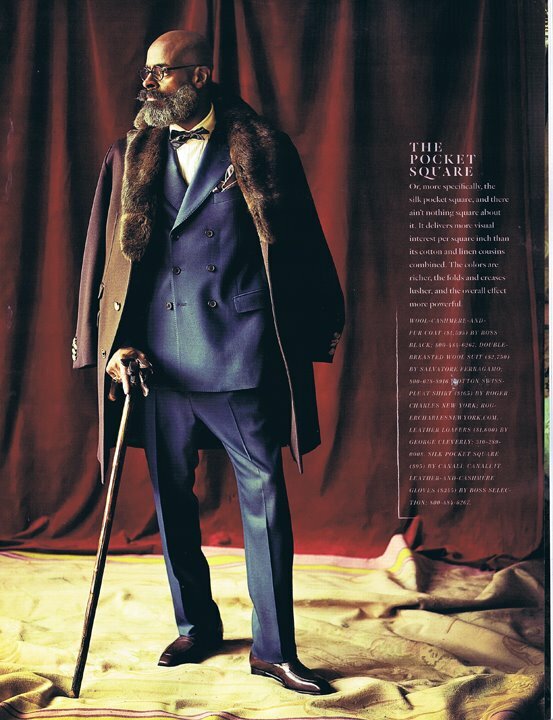 You might catch Kevin Stewart scowling through his beard, coffee in one hand, cigar in the other, as he contemplates life in the thick of stylish SoHo. He’s not mad. He’s just taking it all in. And if you couldn’t recognize him by his beard, you’d know him by the cut of his jacket, the fit of his vest, his swag of his pocket watch fob, and most likely, the tilt of his hat. 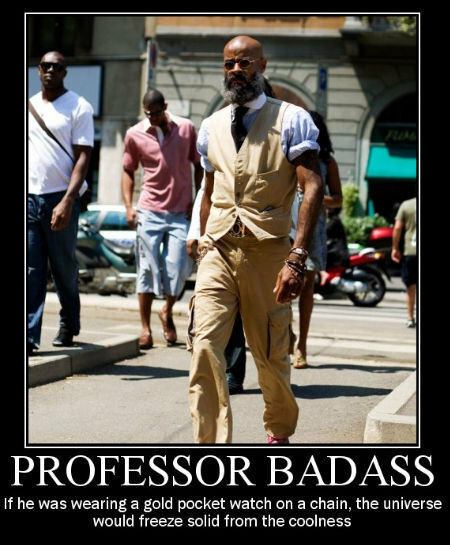 Or maybe by the fact that my dear friend, this former fashion editor for magazines such as Details Magazine, Gear, ESPN whom I’ve known since our days cavorting around Milan, Florence and Paris, back during the twice-annual men’s wear runway shows), has his own meme – Professor Badass! 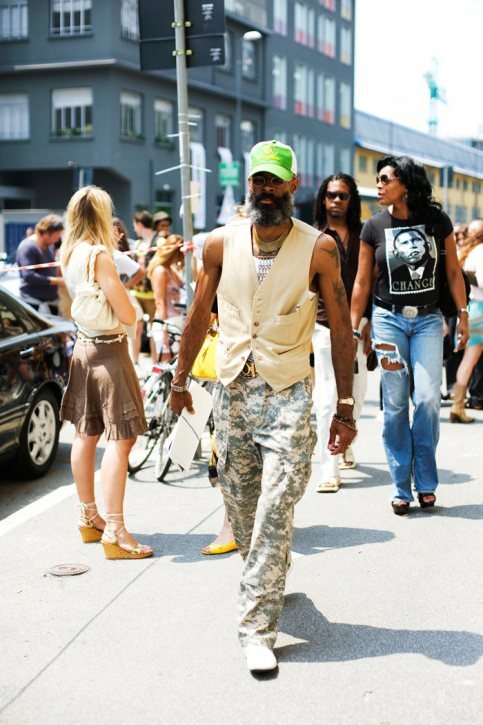 as snapped by Scott Schulman for The Sartorialist in 2008. The picture was captioned, went viral and the badass was born. Crazy, right?! Kevin, a.k.a. 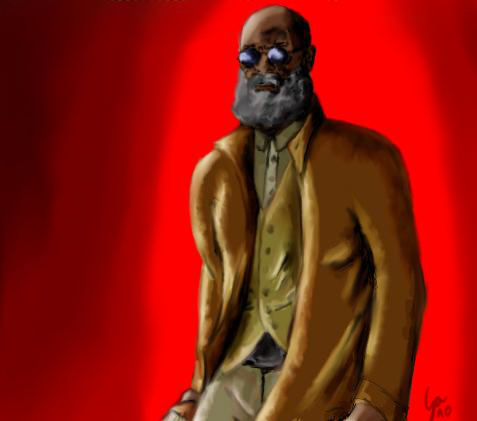 Professor Badass. 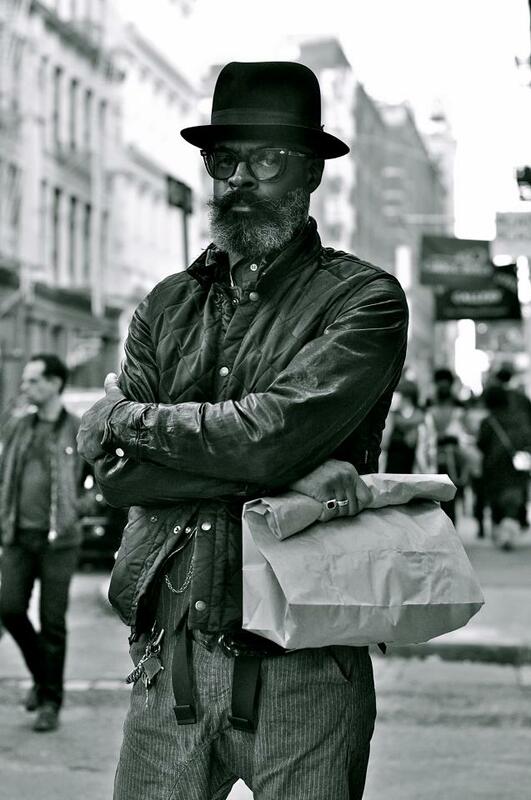 The original photo was shot by Scott Schuman for The Sartorialist. 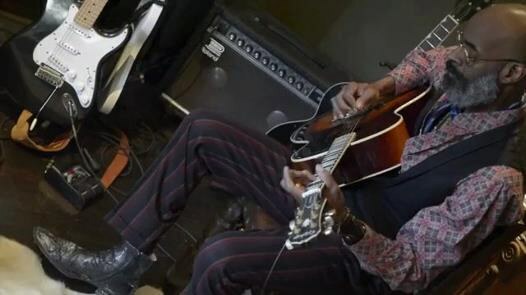 battles the disease of MS with grace, plays acoustic and electric guitar with gusto — kicking it old school style with music gigs in and around the city — and designs his own shirt collection, Old School Shirt Makers New York, a new label which is expanding this month to include women’s. OSSMNY launches with a comprehensive magazine ad campaign and a short film. Chalk Kevin up as one of the old school artists working within a panoply of creative media, from painting to music to film. But his favorite and most recognizable medium? Fashion, of course. 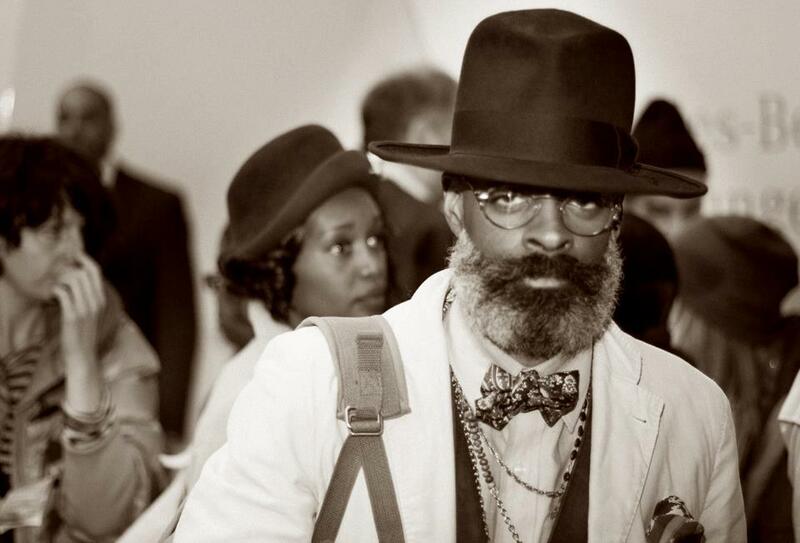 During NYFW, photographed by Pete Hopkins. FashionWhirled: You are a style icon. Snapped by street style bloggers and The New York Time’s Bill Cunningham. You are an influence on the next generation of young fashionistas. As a fashion director and a visual merchandiser, a shirt designer, musician, father and husband, what role does fashion and style play in your everyday life? What is your creative process for dressing every day? Kevin Stewart: I’ve been playing dress up most of my life. It has opened doors for me and I have amused myself. I look at myself as a canvas, I paint on myself with my clothing. I’ve been collecting clothes for many years. Every place I’ve traveled to has an article of clothing bought in these places. Guanajuato, Mexico; Cairo, Egypt. Iceland. London. Paris. Milan. The pieces remind me of a time and place I’ve been. This was how I amused myself on the road, working in publishing for 20 years. Styles change, but not me. I’ve always gone my own way. Worn what suited me. I’m not big on trends. FW: What was your “Aha!” moment that led you into fashion? Speculatively speaking, if life’s path had taken a different curve, into where do you think you might have landed? KS: I was planning to be a ROCK STAR, had a record deal in the mid ’80s. My best friend caused us to lose that recording deal. So I became a display artist – worked with clothing, understood visual presentation and how it impacted sales. Eventually, I became a Fashion Director in publishing and traveled like a ROCK STAR! Next best thing, free drinks, traveled, wore great clothes. I may still get around to the ROCK STAR bit, on my own this go ’round, some 27 years later than I had planed. It’s never too late to do you! FW: Who is your style muse and why? 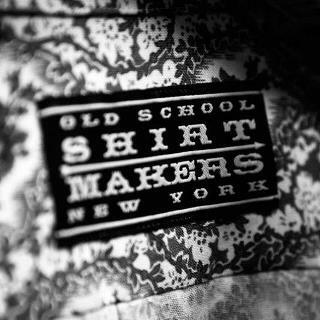 KS: Women, because I’m starting to design and produce women’s tops/shirts for my collection, OLD SCHOOL SHIRT MAKERS NEW YORK. 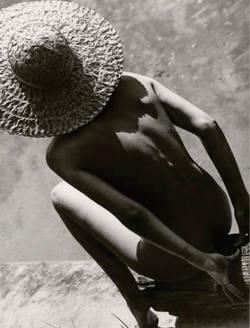 As muse(s), I use women I have been involved with in the past. Women I have been in love with in the past. Friends. Women have always been my only vice! Women and coffee. As far as men, I like iconography! Larger than life men! Civil War Generals. That is the beard influence. Black exploitation heros, like Jim Brown, Fred Williamson, The Hammer. Super Fly, Ryan O’Neal, musician Isaac Hayes, The Black Moses from the ’70s. Blues musicians. Jazz musicians. Louie Armstrong. Miles Davis at every point in his life. I like overly confident, creative and smart men. Producer Robert Evens, photographer Gorden Parks, Bob Guccione Sr., creator of PENTHOUSE MAGAZINE. Gangsters and Outlaws of a time gone by. I like their Swag! That’s about it for influences and men. I’ve taken a bit of their MOJO, mixed it in a pot and made my own Gumbo of style! FW: What impact do you wish to have on the fashion industry and why? KS: I want to be known as a man who took what he did for a living as a serious matter. I lived it! Represented it at all times. “I am a man of style.” This is a part of my “practice at living.” I am, and have been, an Artist first, from the time I could hold a crayon or a paint brush, mold a piece of clay or carve a block of wood. I make art, that’s all I have ever done and wanted to do! My Mother fueled this; she knew what I was early as a child. She knew I would not be a doctor or accountant. I was terrible at math. Kevin, in high school, left, second row up from bottom. FW: Share with our readers your words of wisdom or inspiration, your daily affirmation that you strive to live by in your life. What legacy, fashion or otherwise, do you hope to leave to the future and why? KS: I tried to be myself at all times, sometimes over the top or just bold. I was never shy, just silent to those who did not know me. That was taken as being standoffish. I was just quiet! Thinking about a situation or what I may want to turn a situation into. I never wanted to bore myself. Most of the time I have had to curb my enthusiasm. So as to not be disruptive. As far as “style” goes, I did me all the time at every outing and every turn. This did not take too much effort. I just thought it up and did it! I never was concerned with the thoughts or opinions of others. My Mother made me this way. She gave me confidence that carried me through all of my journey. I had no choice in how to be. TG [thank God], I’m living as much of this life as I can. I like the “RISK” involved in living and creating. I just do it in public view. I do this to the fullest. I hope every one can do the same! This is what makes me the happiest! I’m just at age 48 trying to be the happiest I can be. I don’t want to hurt anyone, only encourage all to live the way that works for them. I had to live this way. For me to be happy! This entry was posted in fashion, Friday:5ive and tagged Kevin Stewart, Old School Shirt Makers New York City, Professor Badass by kim cihlar. Bookmark the permalink. Yes, he’s a badass alright. Great look. Great vibe. A throwback to men who are interested in and can do more than one or two things. Renaissance.